Man or machine? Live or digital? Will the questions ever end?" There's no good reason to explore once again the influence that Kraftwerk has had on any number of electronic bands producing music today. Techno, trance, EBM, IDM, and a nigh-infinite number of other acronyms owe a debt of gratitude to Messrs Hütter, Schneider, Hilpert and Schmitz. These guys were doing it in the mid-'70s, and if the rip-roaring success of their recent spat of live shows is any indication, they'll be doing it in the mid-'10s, too. Given the success of the live dates, it became obvious that yes, now, 35 years into their career, is the perfect time to release the first live album in the history of Kraftwerk. Of course, they do a fine job of it. Kraftwerk has been using computers, making digital music since before much of its current audience was born -- there's no way that the advent of modern digital production via computer would have escaped them. 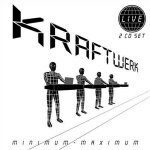 Appropriately utilizing the minimalist title of Minimum-Maximum (thankfully eschewing the gimmick of titling one disk "Minimum" and one disk "Maximum"), the live document that results is the perfect aural replication of the perfect Kraftwerk show. It's all perfectly recorded, perfectly produced, and perfectly tweaked for ultimate impact. Even the track selection is perfect. And should we expect any less from Kraftwerk? The Kraftwerkian devotion to computers is effectively reflected via the calculated feel of the entire album output. Minimum-Maximum was created to emulate an actual live show, but it is actually derived from shows all over last year's world tour. Via the expert mixing, there's hardly a difference in sound quality to be heard from one song to the next, but there's no doubt that they took the best-performed version of most of the songs here, with a few exeptions left in for sentimental reasons (i.e. "Tour de France" is from Paris, "Dentaku" is from Tokyo, and so on). It removes anything resembling spontaneity from the equation, which is fine and all, but it subtly removes the "live" from "live album". In a similar vein, there are places in which the sound of the crowd is turned up, the between-song cheers and the Tokyo singalong of "Dentaku" given the most obvious emphasis. The intention is to make the set sound like an honest-to-God live show, but it's difficult to shake the image of a studio-bound fellow turning up the volume knob on the parts where audience participation is desirable. The other problem lies in the fact that Minimum-Maximum is a document strictly for our ears. So much of the modern Kraftwerk show is a visual spectacle, that removing the visual from the equation leaves a somewhat empty feeling. Anyone who wants to get a true picture of the Kraftwerk live experience will undoubtedly be left wishing for an accompanying DVD that could explain a bit more of what was going on. So much of Kraftwerk's performance is pre-recorded anyway, that really, it might have made more sense to create (another) album of remade versions of old hits, updated for the 21st century. That said, this is still Kraftwerk, and these are still great songs. The four (or five, if you count "Dentaku") song Computer World stretch on disc two embodies everything great about Kraftwerk, from the vocoded vocals to the surprisingly human melodies. Songs like "Metal on Metal" and the beefed-up version of "The Man Machine" that opens the first disc give all the evil industrial kids producing EBM a run for their money. "Tour de France" is as danceable as ever. And creating a barbershop quartet out of synthetic voices in "Autobahn" is a stroke of genius that I'm thrilled made the final cut. The music is wonderful, and deserves to be heard in this or any form. So go ahead -- buy it as a document of the genius that is Kraftwerk. Whatever you do, however, don't buy it expecting anything approximating the Kraftwerk live experience.